7-Eleven, located on Golf Club Rd. in Pleasant Hill, was closed by the Contra Costa County Health Department on July 30 after an inspector found a live rat on a glue trap inside the store, according to the inspection report. The department inspected the store after a customer complained to the health department, saying they saw mice droppings on the floor next to the chip stand. Inspectors says they also found mice droppings on the floor, and a set rat trap under the soda machine. The store has since been reinspected and reopened. At least they caught the rat. That was my thought too, at least they were trying? So, what is a place supposed to do if they know they have an issue with vermin? They put out traps and try to rectify the situation yet they are getting blasted for trying to do the right thing? I can’t talk about the cleanliness of this 7-11, but with the high amount of rain last year along with how dry things have been this entire area has exploded with rodents. Rodents are going to be there regardless, it’s how they store food and how clean they keep their establishments is what I’m worried about. You’re making excuses for uncleanliness. I’m assuming you’re not a health inspector (and either am I) but I have a friend who is a health inspector for Alameda County. He and his wife are both health inspectors. He told me keeping a restaurant or a business clean isn’t any different than those of us who keep our homes very neat and clean, while others are just the opposite. He told me there’s no reason to not pass an inspection, and people who don’t pass are dirty owners or managers who refuse to clean and refuse to spend money on professional exterminators. He also told me that he and his wife rarely eat out, which is common among health inspectors. I thought he was teasing. After reading all these reports, I now think he was being serious. I don’t blame him. This place should be closed. It’s disgusting. Really? How many employees/customers enter your home every day? I get your friend’s point, but to claim it isn’t any different is BS. Rollo – So you know more than someone who has been doing this for over 30 years? Wow. If you’ve ever worked in the restaurant business, you know the saying. “If there’s time to lean there’s time to clean.” I did it for “two something an hour.” It can easily be done if the owner/mgr./employees aren’t LAZY. Kentucky, if your friend never eats out doesn’t that kind of prove my point that every place has an issue? There is a pest control person further down that says the same thing. I’m not making any excuse for cleanliness, but I’m being realistic that I don’t think it’s possible to keep rodents and insects out of an establishment 100%. The best advice someone gave is to look at the bathroom to get a good idea on how clean the place is. I didn’t say I know more. I said equating keeping a private residence clean and keeping a restaurant clean is BS. Pyrrhus – I understand what you’re saying – but, no, not every place has an issue. He and his wife are sick of looking at restaurants – period. He did tell me about restaurants in the inner city of Oakland that easily pass – so if restaurants in the inner city can pass – not all restaurants have an issue. I don’t know about rodents in a business, but I do know that most restaurants in the area don’t hit the Claycord report – which means they’re passing. All restaurants are inspected. It’s the same restaurants over and over again. I do agree with you about public restrooms. It’s a strong indicator of how clean a place is. Rollo – What he meant was if you’re not lazy, you can keep the place clean. Restaurant or home. I’ve worked restaurants and they’re not hard to keep clean – if you have the right owner or mgr. All it takes is hard work, and hard work should be done in ANY business. Do your friends eat? Grocery stores are just as bad if not worse than restaurants! BLACK KNIGHT – They eat once a month. My husband and I bring the pizza. They supply the beer and wine. 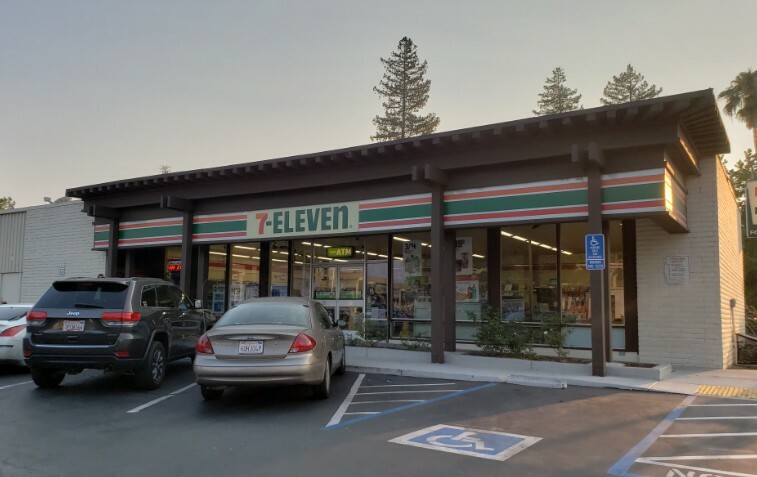 Haven’t been to that 7/11 since high school (1975) or DVC to get snacks. That place has been there for a long time. Find how they are getting in and that will cut down on a lot of infestation. It’s good they are proactive. That is one of the problems of a Glue Trap – it can take quite a while for the animal to die. And squealing all the time. I had one mouse manage to get into the house from a crack in a vent which I then sealed. I would not go into a humane trap so used a glue trap. Trying to remove it from a glue trap would rip it apart. When I had a problem with a mouse that got in the house and scared the daylights out of the cat, I bought a humane trap and caught it. It was easy. You have to use peanut butter. All the stories about mice and cheese are just the stuff of fairytales. They love the peanut butter. I would never use one of those glue traps, or even the snapping variety because they are just too cruel. Glue traps are such a cruel way of capturing/killing. I had a mouse get caught in a glue trap in my apartment years ago. I had to listen to it scream all night because I didn’t have the heart or nerve to pick it up and throw it out in the dumpster while it was still alive. I will never allow glue traps in my house again. I have more sympathy for the rat than 7-11. I agree. Glue traps are cruel. So is poison. There are alternatives. Clark Pest Control uses old fashion mouse-rat traps and then will seal the premises to keep rats from coming in. Set Sacramento government glue traps. Lots of rats there. Well at least the new 7-11 at the Shell station Clayton Road / Kirker Pass will be nice and clean when they open. I’ve been in pest control/rodent proofing business for over 10 years, and if most of you people giving this place a hard time only knew. Most the places you eat at have rodent problems it’s just not spoken about. Rodents are scavengers and go wherever they can find food. There is no way to completely rid anywhere of rats that have frequent traffic because of doors being opened and closed. Once even one little mouse gets in, it’s really hard to catch them because if they have unlimited food sources, they usually will not go to a trap unless they absolutely have to. Lighten up a little bit and realize rodents exist and we can’t do anything about that. You’re right. We moved here, to a brand new development in 1958. and low and behold there were rats in the area because it had been a walnut orchard for years. Still have some of the giant rat traps my father put out to kill them. There were three or four houses completed in the entire development that backed up to a vacant field that ran the entire length of Pine Hollow Road. We were the intruders! At that store I don’t know which is worse, the rats inside or the ones who hang around outside. The rat that was inside was likely far cleaner than the rats you see hanging around outside. BTW – If you have an unintended victim stuck in a glue trap just pour a little vegetable oil on it and gently scrub it with a Q-tip. Don’t get bit. I agree with Dr. Jellyfinger! I work in an office and opened a box of samples for a job and there was a red cockroach in the box. The label said it was picked up from the sender’s office in Sacramento on Monday at 4:30 and it arrived at our office in Walnut Creek on Thursday mid afternoon and there he comes scurrying out!